long and winey road: We got the grapes!!! After a couple weeks of speculation and "what if?" planning we are now confirmed for grapes for both the Wahluke slope Syrah and the Anderson Valley Pinot Noir. At a minimum we will have two barrels of Pinot and one barrel of Syrah, at a maximum we'll get carried away. Last year Dan led a group at Crushpad making Syrah and I set out with my dad to make a barrel of Wahluke Slope Syrah. With both of those wines still in the barrel and both of us rearing to go for bigger and better things we'll see where this goes. 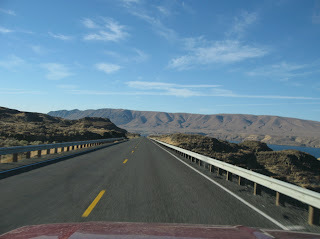 In the meantime i'm attaching a photo of last year's drive to the Wahluke Slope to tie into the "bad" pun that is the long and winey road.